By Beccy Tanner, The Wichita Eagle, Kan.
Nov. 01--Nearly two decades after his death, Brian Friesen's name continues to resonate with banjo players around the world. 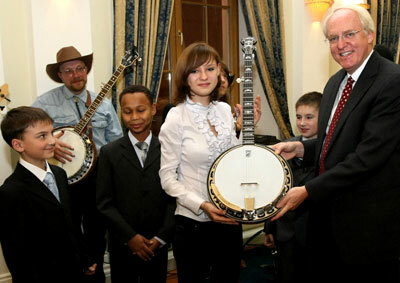 This year, an award honoring Friesen's memory will give an orphaned teenager in Russia the chance to own her own professionally made banjo. Brian died in 1994 at the age of 7. He was the son of local country radio personalities and musicians Bekki Gardner and Orin Friesen. Up till the day before he died, he led a normal child's life . He was helping his 3-year-old brother, Jesse, color a picture of a policeman when the small headache Brian complained about earlier suddenly became unbearable. He collapsed from a brain aneurysm and died a day later in a Wichita hospital. But the story is also how his parents and a major sponsor have, in the years since, quietly gone about sharing Brian's enthusiasm for music with children who are talented but whose families lack the resources to allow the kids to pursue musical careers. Brian's love of music and particularly of playing the banjo, prompted Janet Deering of Deering Banjo Co. in San Diego, a longtime sponsor of Orin Friesen's bluegrass show on KFDI, to set up the Brian Friesen Banjo Award. "We've done this to bring the joy of playing banjo to young people who show promise," Janet Deering said. "Orin and I are old friends and when his son passed, we came up with this way of honoring Brian's memory." Deering and Friesen say there has never been much publicity about the award because the emphasis is about rewarding good work. "Each year we try to find a child that shows promise playing the banjo but doesn't have a quality instrument," Orin Friesen said. "Then we present that child with a top-of-the-line Deering Banjo with 'Brian Friesen Banjo Award' and the date engraved on it." At first the banjos were presented at the International Bluegrass Music Association Fan Fest each year in Kentucky. Friesen said they would identify the child's musical hero and have that person present the banjo to the child. The first award was given in 1995 and went to Benji Flaming, who has since become an innovator in the International Bluegrass Music Association. Later, the banjos were presented at the Grand Ole Opry by people or groups including Ricky Skaggs or Riders in the Sky. One recipient was 5-year-old Ryan Holiday, who was later promoted by the Opry as its youngest performer. The person who often scouts and picks each year's banjo recipient is Pete Wernick, a Coloradan also known as Dr. Banjo. When he traveled to Russia, he saw a teenage girl who could play a mean banjo. "Because I am a teacher of bluegrass, I teach all over the world. I run into a lot of young musicians," Wernick said. "What we look for is a kid who is making great progress and could use a better instrument." This year's recipient, Lisa Karpatcheva, lives in an orphanage. She is 15 and plays a banjo that she borrowed from a friend. She does not speak English, but plays in a bluegrass band. This month, she will receive the banjo, valued at $5,000, from U.S. Ambassador to Russia John Beyrle. "Lisa is a member of a band in Russia called 'Cheerful Dilligence,' " Wernick said. "They are mentored by a teacher in the town of Obninsk. She is a good player." For the givers of the award, this year's award is especially meaningful, in part, because it has gone international. "The award has actually not been promoted or publicized because we honestly didn't want parents dragging kids up and shoving them in front of our faces," Deering said. "It has been a quiet thing. And yet, we are always watching for who would be a perfect fit for the award. We think this girl is perfect." Reach Beccy Tanner at 316-268-6336 or [email protected].